In the land of broadband, there’s a lot more than just Telstra these days. A lot of smaller providers have cropped up in recent years, and thanks to the wholesale nature of the NBN, there are now more than 100 to choose from, depending on where you live. With so many little telcos knocking around, it’s hard for any to stand out from the crowd. However, one that has managed to do so is MyRepublic, and it’s been labelled the ‘Telstra killer’. Find out why it’s earned that reputation as we compare Telstra and MyRepublic broadband plans. Originating from South East Asia, MyRepublic offers simple, no-frills plans with incredible value, whereas Telstra’s broadband plans sit at the more expensive end of the market. So why would anyone go with Telstra these days? Well, you might be surprised to know there are still many reasons to go with Telstra, but with MyRepublic in town, you now have a tough decision to make. It’s a David vs Goliath battle, so let’s see who will win the fight. MyRepublic vs Telstra: How do they compare? It’s the battle of the young hotshot upstart versus the old, tried and tested veteran. MyRepublic’s plans are certainly cheaper than Telstra’s comparable offers, but once you factor in the added features that are available with Telstra’s broadband plans, you start talking more about ‘value’ than just ‘cheap’. So it really depends on what you’re looking for as well as how much you want to pay. MyRepublic: Unlimited data as standard, starting at $69.99 a month. Tier 3 NBN speeds already bundled in. Telstra: Prices starting at $70, with unlimited costing $99 a month. NBN 50 speeds as standard, with speed boosts from $30 a month extra. MyRepublic benefits from being more focused on just broadband; Telstra has 24 month contracts as standard, except it benefits from the addition of Foxtel entertainment and other perks. Here’s a glance, with unlimited data plans on show. From the snapshot above, MyRepublic seems to have it all over Telstra in terms of budget broadband plans. This is especially true on the NBN. In fact, Telstra’s unlimited data plans cost close to $100 a month. Also, all of Telstra’s NBN plans are on Tier 3 as standard, which if you’re familiar with the NBN Speed Tiers, offers download speeds of a maximum of 50Mbps. MyRepublic’s plans also start off on the Standard Plus evening speed (Tier 3 NBN 50) but the price jump from this to Premium 100Mbps is $20 – two-thirds the price of Telstra’s speed jump. MyRepublic has a series of ‘Gamer Plans’, custom fit for gamers with things like static IPs and speed prioritisation; the plans also often include discounts to things like PlayStations, gaming mouses, VR headsets and more. So, it appears that MyRepublic has it all over Telstra in terms of budget value, but where does Telstra come to play? For NBN plans, Telstra offers an unrivalled amount of perks and extras. This is especially true as you move up to the higher price brackets. For example, plans over $100 a month often include extra goodies like Foxtel packages. Foxtel Entertainment & Sports packs are included on plans over $120. Telstra TV is included on many plans, making it easy to watch Stan and Netflix. Telstra offers pay-as-you-go home phone call rates as standard, but MyRepublic offers call packs from about $10 extra per month. If you’re in the market for a Pay TV subscription anyway, it could make sense to go with Telstra who have it all sorted. So if it’s all-out entertainment you want, it makes sense to go with Telstra. If you just want no-frills NBN then it pays to go with MyRepublic and its top-tier speeds. As part of the Australian Competition and Consumer Commission’s (ACCC) crackdown on misleading NBN speed advertisements, the consumer watchdog periodically reports on true NBN speeds. 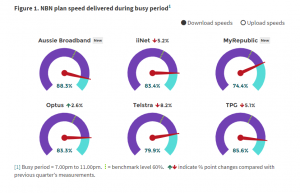 It found fairly recently that Telstra could perform at 79.9% of its plans maximum speed limits in peak times, whereas MyRepublic could perform only at 74.4%. This study is a collection of real-world speed tests and could shed some light into which provider could more reliably attain top speeds – or close to. However, neither were exactly stellar performers with the likes of iiNet, TPG, Optus and Aussie Broadband outperforming them. The 5 percentage point difference may not mean much to you, but it does give an indicator into what you can expect with the telcos. The ACCC releases these reports periodically, about once every six months. This one’s a pretty easy one to compare – MyRepublic does not have any cable broadband plans, whereas Telstra does (depending on your location of course). Telstra’s cable broadband benefits from having fast broadband that rivals the NBN for speed. It’s only available in selected areas – usually capital cities – so it’s worthwhile having a look to see if it’s even available in your area. The minimum you can expect to pay is $70 a month for the most basic plans. And the most expensive is over $100 a month for unlimited data. Entertainment bundles are not sacrificed here, either. With selected plans, you’ll get the Telstra TV entertainment bundle included as well as Foxtel packs from time to time. It’s a pretty easy win for Telstra here. MyRepublic vs Telstra: Who wins the fight? On the surface, MyRepublic does appear to offer the best ‘bang for buck’, and based on cost alone it does prove to be the ‘Telstra killer’. However, there is still merit for Telstra. Due to its partnerships with the likes of Foxtel, opting for a more expensive plan with Telstra may prove to offer better value. As it we mentioned earlier, it’s a case of cheap vs value. If it’s just straight broadband you want, then you might want to choose MyRepublic. Its Tier 3 & 4 NBN plans and unlimited data, as well as no-fuss DSL plans, make it the most cost-effective option, and also offers an interesting set of ‘gamer’ plans. If it’s unrivalled entertainment you want, then you might want to choose Telstra. Its partnership with Foxtel makes it a ‘double threat’ in terms of broadband and entertainment. So, MyRepublic isn’t exactly the Telstra killer a lot of pundits were betting on. There is still strong merit for Telstra, but it all lies on what you want out of your broadband provider. As usual, it pays to compare a bunch of different providers to see how far your dollar can go.